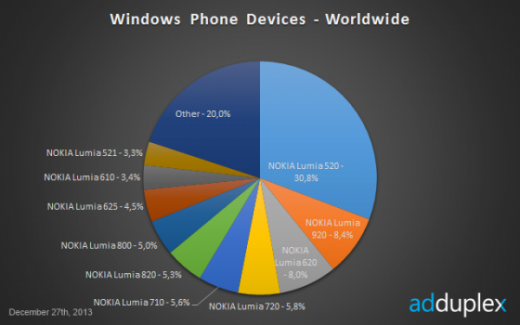 Mobile industry markets analysts, specifically Windows Phone devices, AdDuplex company, today announced the most recent data, about the share of mobile devices under Microsoft’s mobile platform. The point is more – or less unchanged since the cheap Nokia Lumia 520 is still the best-selling and most popular windows phone in this segment of the industry. Globally Lumia 520 currently holds a 30.8 percent stake, looking at all available Widows Phone mobiles. Second place holds Nokia Lumia 920 with a share of 8.4 percent, and the third is Lumia 620 with a share of eight percent. Glancing at the data related to cell phones on Windows Phone version 8 thing has also remained the same, but with a slightly larger leading figures. Nokia Lumia 520 in this section has a share of 39.3 percent, followed by the Lumia 920 with a share of 10.8 and Lumia 620 with a share of 10.3 percent. The data provided in connection with manufacturers of mobile phones on the platform Windows Phone, Nokia is by far the most dominant with a share of 92.1 percent, followed by HTC with a share of 5.2 percent and Samsung with a share of 1.6 percent.